Here's a lesson that I'm still in the process of learning. I have this tendency to jump into projects with both feet, to think big, to go for the big splash. Of course that often means that I find myself over my head, or short of time due to the complexity of the project. On the plus side I learn a lot. Planning art projects with PP is no different. 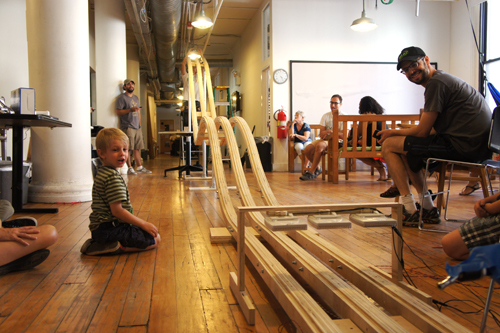 I've more or less committed to building an entire Nerdy Derby for his birthday party (shhh, it's a surprise.) Like I said, thinking big. That said, sometimes it's good to remember just how much creative play and satisfaction can come out of just a few simple materials laying around the house. Take the picture below for example. 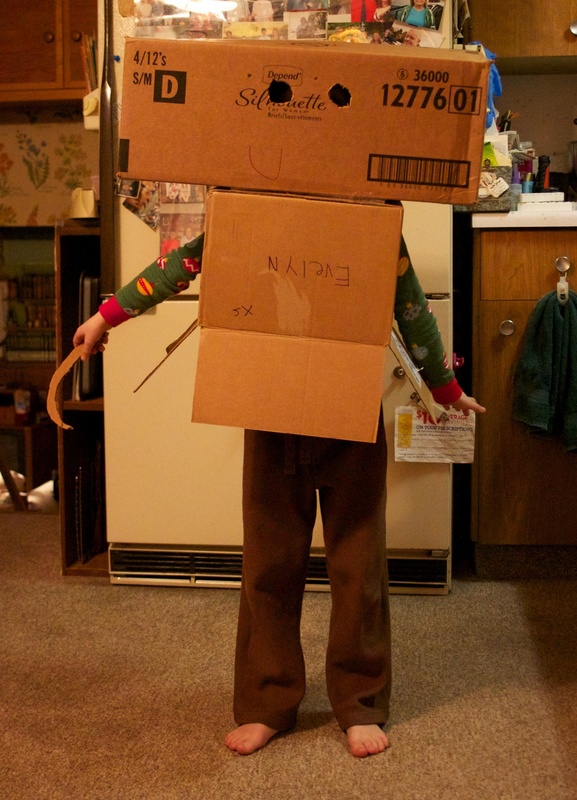 A few used boxes, a pair of scissors, and some packing tape can make a robot costume that will have junior proudly walking around the house making "meep meep" noises, and comically failing to navigate doorways for a good hour. It's a good lesson for me. Sometimes you should just relax and say "what do you think we can make with this" instead of dreaming about what you could make with an arduino and 16 servo motors. Addendum: One funny story about the above costume. He cut the eye, arm and neck holes in the boxes, then put them and AND THEN had me attach the head to the body. When it came time for him to take it off for further modifications, we found that the neck holes in the body and head weren't alined. There was room enough of his neck, but absolutely no chance his noggin could pass through the opening. It was a tricky maneuver, but I managed to cut him out of it. That cardboard sickle in his hand is one of the resulting scrap pieces.